I’ve been reviewing the data for the last few months, in particular analysing the difference between daytime and evening patterns at a weekly level. Whilst the weather has featured as one of the biggest disruptors to recent footfall volumes, the notorious Beast from the East actually had no impact on the relative proportions of footfall during daytime and evening. Both day and night-time footfall saw week-on-week declines close to 15% at the end of February, followed by a similar bounce-back the following week. Another trend that can be forecasted and acted upon by retail stakeholders is the large difference between day and night-time volumes seen in the week commencing 16th April. In this week the night-time footfall increased by 5%, with no corresponding increase during the day. This lead me to wondering what caused these night owls to appear, and why on this week? This trend was seen to varying degrees across all regions, so it would be a stretch to say that this was due to any local events or weather. As seen in Figure 2 below the North East and East of England were the regions which saw the highest relative increase in night-time footfall during this week. Within these regions our sensors in Durham, Newcastle, Norwich and Cambridge all showed large relative increases in night-time footfall. Do you notice any similarities for this selection of cities? Not only are they well-known for having large student populations, with a high ratio of student to residential/worker population, I’d argue that they all have a relatively compact centre. The week commencing 16th April just happened to be the first week of term for many or saw students returning a week prior to the start of the term at their respective universities. All of the cities that saw a high increase in night-time footfall have an above average percentage of occupiers that are classified as leisure, with bars, pubs and clubs all being very well represented. This could go some way to explain the increase experienced in footfall, with it being well known that students like to mix work with pleasure providing a boost to the night-time economy within a city centre. "Early week footfall for us is very much driven by the University term and exam cycles, and in cities where there are multiple universities (such as Oxford for example) we see the impact of the University terms based on the night of the week that we trade to target students of that University. So for example, in Oxford we saw the Brookes students return the week earlier but the Oxford University students return a week later. Footfall was then very much suppressed through May as students went into their exam period and so spend more time in studying and less time out relaxing and enjoying leisure experiences." Often within these locations there will be a street or area that is particularly well known for eating or drinking hotspots, for example Wind Street in Swansea or Broad street in Birmingham. This can lead to very different footfall trends within these areas, as opposed to nearby areas that are heavily retail-focused, or which are geared up to provide lunch for hungry office workers. 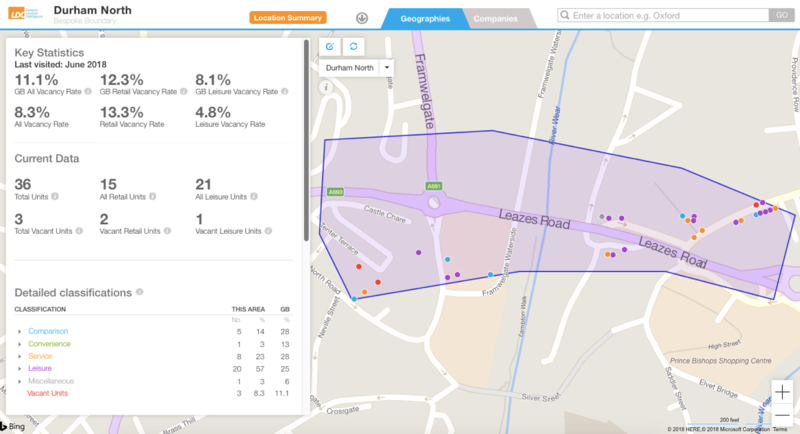 Durham is a particularly interesting location where our six installed sensors have very different footfall volumes. Some have markedly different trend profiles, with one or two showing week-on-week increases in volume as the others are falling. Figure 4: Weekly footfall volumes across sensors located in Durham. (Source: LDC). The two devices in the north of the city (North Road and Walkergate) have the lowest footfall volumes and saw the lowest relative increase in night-time footfall during this week. With almost two thirds of surrounding occupiers within the leisure classification, these two locations already had a strong afternoon evening footfall profile in week 15, and whilst the return of the students in week 16 had little impact on total volumes, the peak times were brought forward from 9-10pm to the afternoon/early evening. In contrast, the locations with a stronger retail focus saw relative gains in the evenings – perhaps as students combined shopping trips with evening socialising around the retail core. Subtle changes in the footfall profiles across different location types highlight the benefit of installing a network of sensors across a city centre, so that distinct zones can be identified based on their different profiles and relative changes to these. One sensor within a city is merely giving you half of the story for that place. Footfall in different locations responds to events and triggers in different ways, based on the demographics of the key audience driving a change (e.g. students), and the mix of occupiers within a certain area. 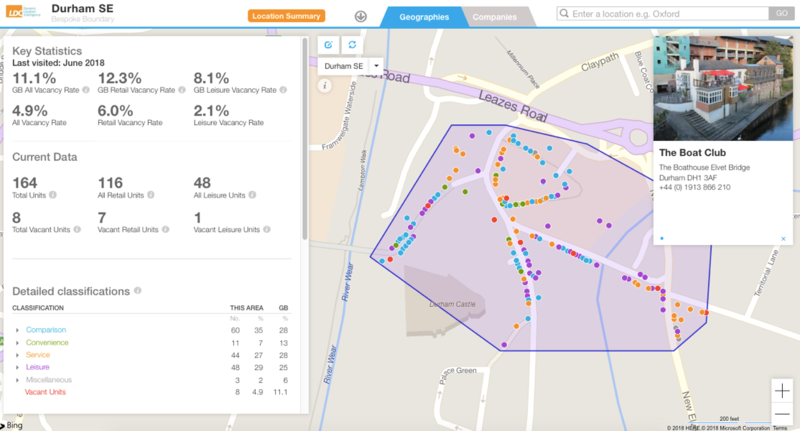 LDC’s footfall network allows retailers, leisure occupiers, BIDs, Local Councils and other stakeholders to understand the granularity of how GB locations are used by hour, day and season. Our proprietary technology is designed to provide a commercially viable way to install a network across a location, estate of stores or other assets to understand the varying trends and flows around a location. This is absolutely key in understanding and taking advantage of seasonal opportunities, such as the influx of a student population, music festivals and even changes in weather and the micro-locations which are impacted the most. For more information about LDC’s footfall data and technology, visit the LDC website by following this link.